Despite coming from a noble background, Veloth viewed his homeland with disdain as he believed Aldmeri society was founded on ambition, greed, and decadence. The young mystic called out to his downtrodden countrymen and found support from those who hoped for a society that preserved traditions, praised honesty, and rewarded the just. Seeking a more ascetic, stoic and pure way of life for his followers, Veloth inscribed the Velothi Prophecies which abandoned the commonly accepted worship of Aedra, in favor of the Daedric Princes Boethiah, Azura, and Mephala, collectively known as the "Good Daedra". He also instructed his followers on how to carefully negotiate with the "Bad Daedra", also known as House of Troubles. This ability to distinguish the good from the bad was a hallmark of the living saint, as was his penchant for healing and healing items. Some sources claim that it was Boethiah herself who influenced Veloth's decision to reject the Aedra through dreams and visions. 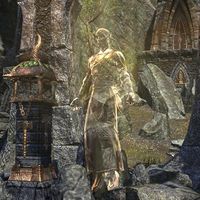 Other accounts relate that Boethia took the form of the Aedra Trinimac and taught Veloth and his followers the rules of Psijic Endeavor - a method where supposedly mortals could ascend to become gods. Whatever the origins of Veloth teachings, more and more Aldmeri clans accepted Veloth as their prophet and guide, and the Velothi dissident movement was born. In response, Veloth and his followers were scorned and cast out by the establishment. The Sapiarchs of Alinor prohibited the schism, and Trinimac's priests condemned the movement for blasphemy and threatened exile, should Veloth's followers not abandon Veloth. Eventually, Veloth and his followers embarked on a mass pilgrimage from Summerset to the northeast of Tamriel, with the promise of a new land and a better future. According to the contemporary texts, he "spared not a boat, ration, or strong-armed soul among his people in this exodus and toiled to reach the land of Resdayn." Known as the time of Great Despair, Veloth and his followers traveled for untold weeks, crossed the sea and climbed a mighty range of mountains. Many among the Chimer considered this path to be folly, but they were driven by Veloth's leadership and unyielding certainty and commitment. Veloth drove them onward, chasing a vision that had come to him in a dream. He claimed to have seen a great hawk in the sky and vowed that the hawk would lead the Chimer to a new home. According to legend, they finally reached a great pass cutting through a mountain range covered in snow, but a large wall of ice blocked their path. A young woman appeared before Veloth and demanded that he swear an oath before she would lead them to their new home. Veloth cast aside his mighty Daedric warhammer and vowed to dedicate his life and soul to his people. The young woman melted the wall of ice and revealed a land of fungus and ash: Resdayn. Legend holds that when Veloth first laid eyes upon Resdayn, a single tear slid down his cheek and froze into crystal. It later became a holy relic imbued with healing and restorative powers. Veloth's mass pilgrimage to the new land was a success. After renouncing all ties to the Aldmer, Veloth's followers became known as the Chimer and founded a new nation based on Daedric principles. The Chimer settled the area rapidly and flourished, enjoying a period of high culture known to many as the Golden Age. All manner of cultural advances are attributed to Boethiah, from philosophy to magic to 'responsible' architecture and spirituality. 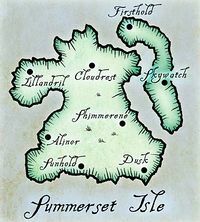 One of the first Chimeri settlements in Resdayn was named in honor of Veloth: Narsis-Where-All-Fervently-Praise-the-Prophet-Veloth, which was later shortened to Narsis. Although the Chimer built several Daedric shrines while in Summerset, they were done in secret. In their new homeland there was no need for secrecy, which allowed them to build mighty temples to Boethiah, Azura, and Mephala, and established the traditions of worship in Morrowind that were later co-opted by the Tribunal. Veloth also planted various seeds from Summerset which grew into trees across Morrowind, although very few survived in the following centuries. Eidolon's Hollow. One of the holiest sites of Chimer worship of the Good Daedra. In the centuries that followed after his death, Veloth became one of the most revered and venerated figures in Dunmer history. Veloth is thought of mainly as a peaceful and scholarly soul, to which the Dunmer's healing enchantments that bear his name attest. Ancient Velothi allegories are uniformly heroic successes of Boethiah over enemies of every type, foundation stories of Chimeri struggle. The spiritual beliefs and metaphysical ideals of Lord Vivec spring directly from the teachings of Veloth, whose movement he regarded as an element of barbarism necessary to break from Aldmeri culture. Over time, some of Veloth's teaching surrounding the worship of the Good Daedra fell out of favor among the Dunmer. An act that the spirit of Veloth curiously agreed with, stating that his time had passed. The Tribunal Temple prevailed as the dominant faith circa 1E 700, and Veloth was canonized as a greater saint, patron of outcasts and seekers of spiritual knowledge. Conversely, the Ashlander cult rejects the Tribunal completely and hold true to the teachings and traditions of the Prophet Veloth. They believe that embracing the comforts and decadency of civilization is exactly what corrupted the Aldmer back in Summerset. Several houses of worship exist in Deshaan dedicated to Veloth's memory and to the veneration of relics left him and his original followers. Throughout Vvardenfell are numerous shrines dedicated to Veloth, which grant blessings bolstering Magicka. He also became the patron saint of House Hlaalu. Veloth's people honored him so much, his influence is apparent generations later. The Velothi Mountains on the border of Morrowind and Skyrim are named after him, as are the Velothi towers of Morrowind. The golden age of Chimeri history is known as the period of High Velothi Culture. The influence of antiquity is keenly felt, as "Velothi" is still an accurate descriptor of the Dunmer people, and is used in connection with references to their oldest cultural traditions. Veloth's lineage supposedly lives on through the Veloth family, who have a long and prominent history in Vvardenfell. A number of powerful healing relics are associated with Saint Veloth. Many of these holy artifacts were protected in the vaults of Mournhold Temple in the centuries following his death. 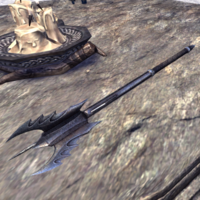 The magical Daedric warhammer Saint Veloth wielded during his exodus from Summerset. This symbol of power stood for everything Veloth embodied. Veloth's Judgment was said to have rang with authority throughout the land. Its enchantments could cleanse corruption from the souls of those it struck down. Veloth's precision with the hammer was such that he could remove the corruption from a soul and leaving the remainder alive and healthy. The warhammer stored the corruption for a time, turning it into energy that could be used by the wielder to enhance the power of the weapon. Veloth saw fit to set aside this weapon when he vowed to turn his attention from war to the task of building a new home for the Chimer in Resdayn. Since Veloth's ascension to sainthood, it was rumored to have has gained legendary powers, to the point where it can siphon a living creature's entire soul. This rumor turned out to be true when the hammer was stolen from the temple in the Second Era. It was eventually returned to the Temple and in the late Third Era it was in possession of a priest in Molag Mar. It subsequently made its way into the hands of the Nerevarine, who later sold it to the Museum of Artifacts in Mournhold. This radiant crystal is believed to be a tear shed by Veloth when he first laid eyes upon the land of Resdayn, the new homeland he had seen in his visions. According to the legend, the tear froze as it slid down Veloth's cheek. Kept by the monks of the monastery of Muth Gnarr, this crystal has great healing and restorative powers - provided the monks maintain a constant vigil and pattern of prayer. This blessed decanter was used by Veloth to carry water to quench the thirst of his sick followers during the exodus, and then later to irrigate the young crops of the new homeland. In the Second Era, the Holy Vessel was housed in Selfora Temple, Deshaan. It is said to be the most important relic in the temple, and the reason why the temple exists at all. In the Shrine of Saint Veloth in Deshaan stands the Reliquary of Saint Veloth. Not a relic, per se, but instead contains perhaps the most powerful and holy relics associated with Veloth - his skull, known as the Sacred Cranium, and bones. The bones of the saint are said to have many magical properties, and pilgrims travel from across Morrowind to receive the saint's blessing. Legends claim that the most faithful sometimes receive visions of the saint while meditating and praying before the Reliquary. In 2E 582, many of Veloth's relics were involved in Magistrix Vox's scheme to de-throne the Tribunal. Magistrix Vox bore a personal vendetta against Almalexia and sought to return Morrowind to Daedric worship. To achieve her goal, she first unleashed the Llodos Plague on Deshaan in order to raise an army of plague husks. In the Muth Gnarr monastery, the Tear of Saint Veloth was used by temple monks to slow the effects of the plague. However, a violent tribe of Ashlanders called the Vereansu believed this act had defiled the Tear, and they attempted to destroy it until their plan was thwarted by the Soulless One, working with the Ebonheart Pact. Vox also stole Veloth's Judgment from Mournhold Temple. After the town of Selfora refused to ally with her, she used the hammer to create a dimensional tear, releasing hostile spirits into the settlement. The Soulless One, with the aid of a temple priest used the Holy Vessel to seal the tear and capture the echo spirit of Vox. In an effort to remove the spirit of Saint Veloth from the battle, Vox travelled to the Shrine of Saint Veloth and called forth the spirit of Veloth. She unleashed a wave of destruction and defiled the Shrine by shattered his reliquary and scattered his bones. This act weakened the spirit of Veloth, and his connection to the mortal plane began to fade. The Soulless One recovered Veloth's bones and restored the Reliquary. In return, the spirit of Veloth bestowed a blessing onto the Soulless One to protect them in their coming battle against Vox. 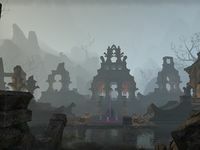 The Soulless One defeated Vox and Veloth's Judgment was returned to Mournhold Temple. The city of Narsis, named after Saint Veloth. This page was last modified on 7 March 2019, at 00:09.